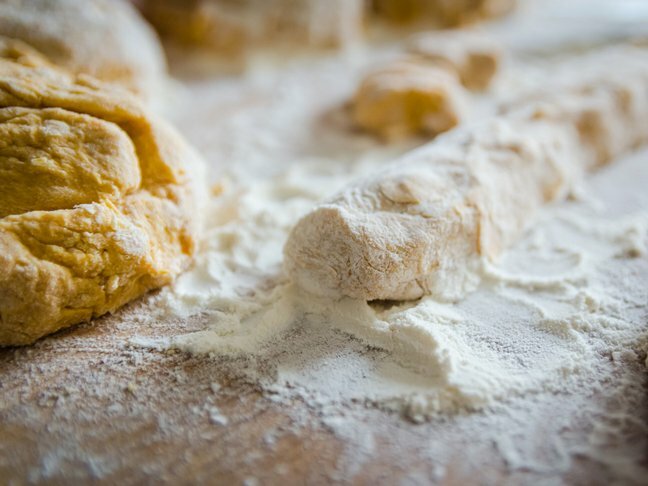 Once or twice each winter my daughter and I like to make a big batch of sweet potato gnocchi with sage cream sauce. It is a bit of a project, but it is worth it. We love the tender pillows of sweet potato tossed with a light creamy sage sauce for dinner. Making them is a real treat since they taste much better than anything I can ever find in the frozen section. It is also a wonderful way to get my daughter to eat her sweet potatoes, a vegetable she rarely embraces. Try this fun cooking project with your children this winter. I promise you'll all have fun and love the result! Step 1: Prick the potatoes all over with a fork and microwave for about 5 minutes per side until tender. Cut in half and scrape the softened flesh into a large mixing bowl, measuring as you go so there is about 3 cups total. Step 2: Stir in the cheese, sugar, and salt and mash well with a fork. Stir in the flour until just incorporated. Step 3: Scoop ¼ of the dough onto a floured surface and use your fingertips to roll it into a tube about 1 ½ inches in diameter. Then cut it into 1-inch pieces. Repeat with remaining dough. Step 4: Bring a large pot of salted water to a boil. 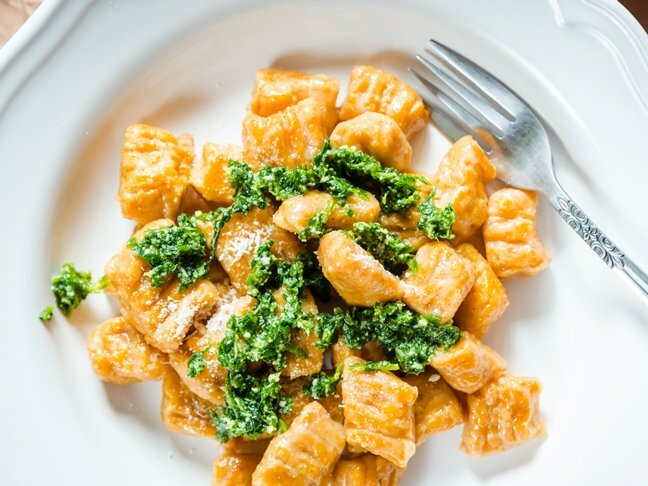 Cook the gnocchi for about 5 minutes, or until it floats to the top. Remove and drain. Step 5: Make the sauce. In a small skillet melt the butter and add the chopped sage. Warm the butter for 1 minute. Then pour in the wine and cream, increase the heat to medium-high, and bring the mixture to a boil. Boil for about 5 minutes or until the sauce has thickened and reduced to about 2/3. Step 6: Season sauce with salt and pepper, toss with the gnocchi, and serve.